has anyone else had this cigar? I had it with a glass of makers mark. It was amazing! I've never seen them, but anything that goes well with a glass of Maker's sounds damn good to me! I've been thinking about picking one up here locally. I really like Montecristo cigars, but was waiting until I saw good things about it. Like to see a good review before dropping $16 on a cigar. I have had several Monte's not this one. 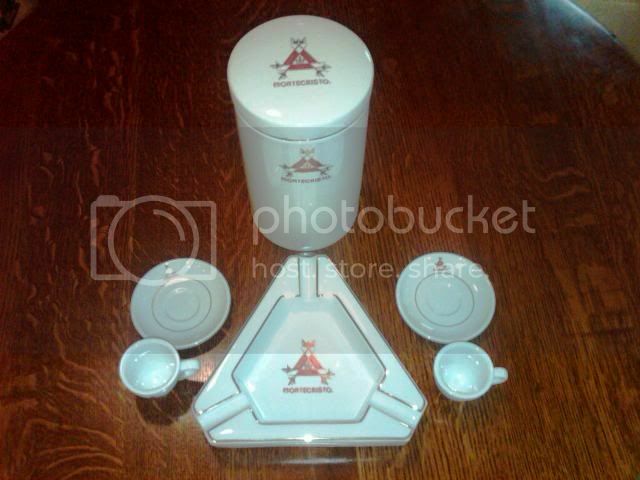 But I did Pick up this Great Montecristo Humi,Ash,Tray,Expresso cup and saucer set for 25 bucks at a local Thrift Store this week.... SCORE! Thats what I thought! LOL Now if all you guys could show up at My house we could have a smoke and some Expresso! I think it would be an awesomething for all of us to get together! Since the lawsuit with Tat I have been boycotting Monte's. I bought a box of whites a while back before learning of the issues between the two companies. After the crap they put Tat through I won't be buying anymore of their products. I don't guess I've heard about that. It'd take a lot to run me off my Monte Whites, though. They sued tat for using the symbol. I do agree though, I love the whites. Yeah, nothings gonna keep me from the whites. Monte White's and RYJ Reserva Real are the reasons I started smoking cigars. Altadis was just sore because PJ and DPG make better cigars than their own Montecristo line. And I might be mistaken, but I don't think Montecristo or Altadis created the fleur de lis that is found on Tatuaje cigars. Just another example of a big guy trying to stifle competition by picking on a little guy. J0z3r, on the other hand, is skating on thin ice. I got my eye on you, bub. For the record urbs, I do enjoy the Monte White, but I think that's the only NC Montecristo I like. It's been a long time since I had the regular Monte, but I don't care for the Serie C or the Platinum. The Media Noche is a good cigar, I just don't smoke maduros much. I like the regular Monte and the Media Noche. I've had a few different cigars from them and I've liked everything I've had. I understand the suit has been settled with Tat making "minor" adjustments to their labels. From some of the articles I read, Montecristo took some heat for filing the suit in the first place, even though they had been using the fleur de lis symbol for some time. It was sort of the Goliath v. David image which rubbed some people the wrong way.